1. Dissolve the coffee in the boiling water then beat into the chocolate spread until smooth and softened. Mix the chocolate spread into the yogurt, then finally stir in the chopped chocolate. 2. 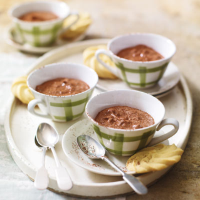 Spoon the mixture into espresso cups or small ramekins and chill until ready to serve. 3. Dust lightly with cocoa powder and serve with a biscuit on the side. Tip - Use low fat Greek yogurt as a delicious alternative to cream to serve with desserts, tarts and cakes. For a change, try swapping the plain chocolate for 50g finely chopped hazelnuts.